I like things different some time . About 10 years ago I purchased an old bike that was well a wreak . I had no idea what it was other than it was built with Chater Lea lugs and drop outs as far as I could tell . Twin oilers on b/b and one on the head tube. It had been painted with a yard brush . I reckoned it was worth saving given it age . A respray followed and I Named it the "The Derby Flyer" It was later identified on this forum as possibly an Early F W Evans by Terry. This is the end result. A fixed /single speed free wheel . Hence the back brake. Last edited by bagpuss on Sat Sep 15, 2018 5:25 pm, edited 1 time in total. 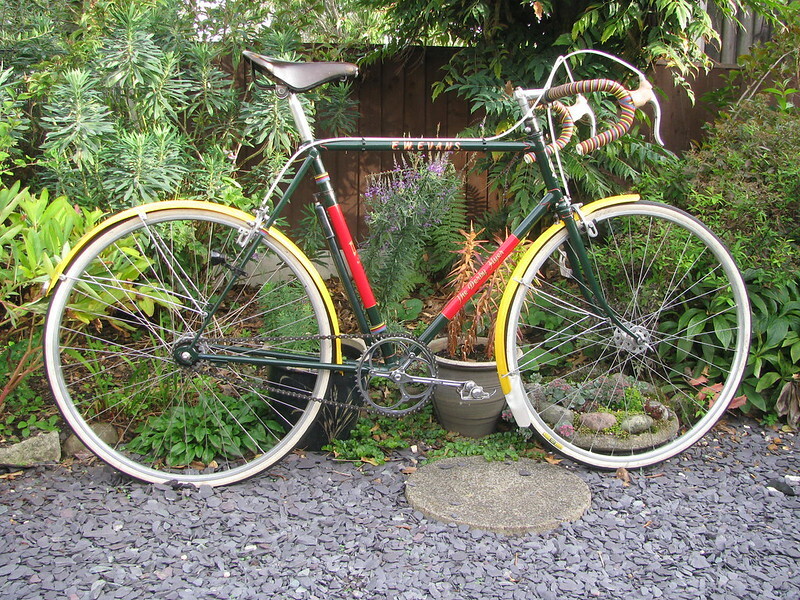 27 in wheels and mudguards would fill the gaps a bit in what is a crackin frame. Fitted 27 x 1 1/4 wheel set,still fixed /single speed free wheel . Had to make do with yellow mudgaurds as I nothing else available,left . Post subject: Re: RBotM September 2018 - Open Month - Nominations Now Open! Getting close to closing this one. A couple of hours left if someone wants to enter still.